This is a Beautiful Black Silk Sinamay Disc Headpiece, from Couture Milliner Edwina Ibbotson, with Black and White Voile Roses on Top and Underneath sides, with Sprays of Clear Wires threaded with little Black and Clear AB crystals and Beads. The Saucer Sits on top of a large Skull Base, with the Flowers on the underside sitting above the head and covering the Skull. 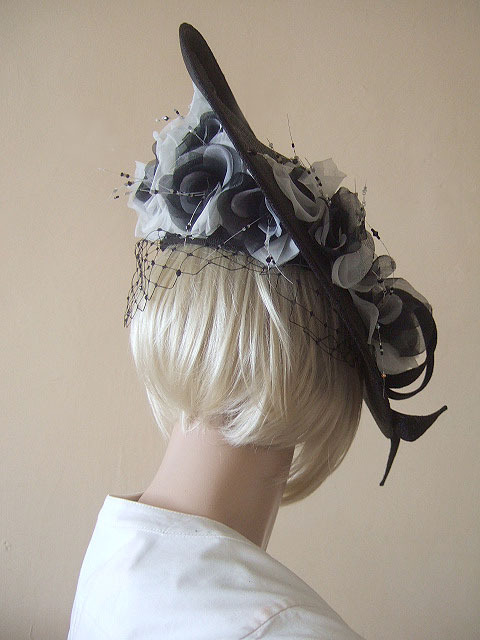 A Black Merry Widow veil then hangs down over the face, and is decorated with Black Crystals. Fits all sizes with the skull sitting over crown of your head, and a Comb on the Inside.. Height from top of ear to top of saucer when worn is 9.25".